The league course for the month is a painfully technical numbered sequence that stresses skills of an “International” flavor. Now that I’ve scared the crap out of you… let’s talk about solving this riddle. Take a moment to inspect the course and think through your own handling solution. I’ll follow up with a bit-by-bit briefing of my own. This course might lull the handler out of any sense of urgency in his own movement. It is useful to consider when practicing the course in walk-through that movement is both direction and motive to the dog. Take note of how many errors occur on this course if the handler is: A) standing still; or B) facing the wrong direction; or C) both. The opening is actually fairly simple, but not without risk. First of all, you should make the dog’s approach through the first two jumps as straight a line as possible. There’s no good reason to demand a turn between jumps #1 and #2 when they line up neatly. You could, from the start, use a bit of parallel path pressure that will allow you to be in position on the landing side of jump #3 for the turn to the tunnel. After jump #2 there are two jumps looming as wrong course options. The handler needs to work the turn until the dog’s nose comes around to address the #3 jump. Another wrong course option is open to the dog after jump #3, that wingless jump sitting out there without a number. Jump #3 is a bar most likely to get dumped in this opening. The handler might be guilty of unproductive loitering on the landing side of the jump, engaging in antics that draw the dog into handler focus, when he really needs to be in obstacle focus. 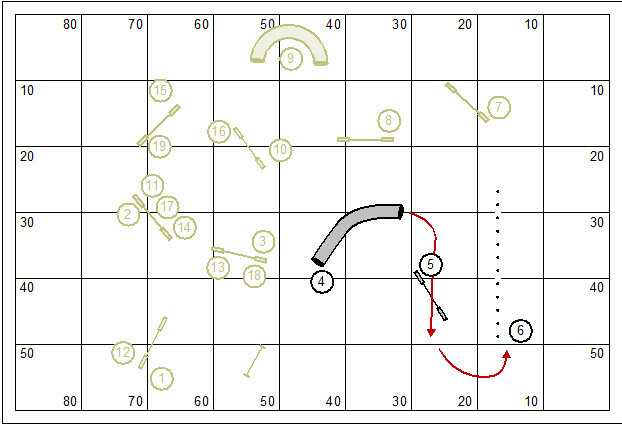 If the handler can pre-cue the turn after jump #3 the dog should neatly make the turn into the pipe tunnel. The contest will be won or lost in how efficiently the handler can cue the dog into his turns. In this short sequence the handler might need a single change of sides to the dog. The riddle is how and where to make that change of sides. Don’t take the #5 jump for granted, the flow will not have much natural logic to the dog. The handler has little time and less room to turn the dog to the jump. It might help the handler to realize that he needs to allow the dog to carry through the jump so that when turned back to the weave poles the approach is not too perpendicular. It’s possible for the handler to pre-cue the right turn out of the tunnel with a “backy-uppy” presentation of the pipe tunnel. The efficacy of this presentation might border on theoretical. But theory becomes practice if tested in training with the dog. 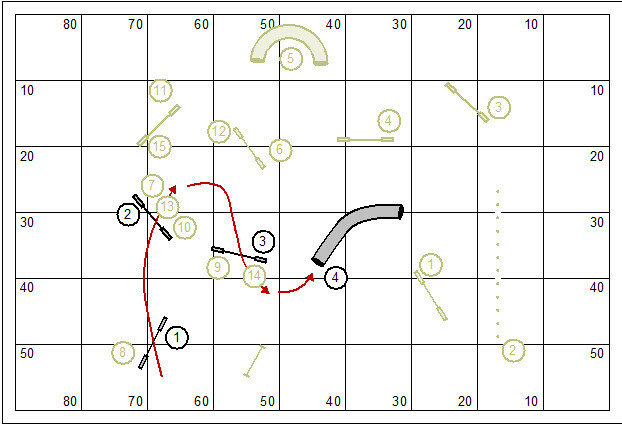 To get the change of sides the handler might Front Cross on the approach to jump #5; or Cross on the landing side of #5 as the dog is making his approach. Another possibility: the handler could approach jump #5 with dog on left, using a Tandem Turn (rear cross on the flat) after the jump. In either choice for the change of sides it is the handler’s job to shape the dog’s turn and approach to the weave poles. This is the closing of the first half of a course which has been a series of technical bits fitting together like puzzle pieces. #7 is a Backside. The dog will be spying that #7 jump all the while he is weaving. The handler has about 8′ of real estate after the weave poles to convince the dog that we’ll be taking the jump from the opposite side. 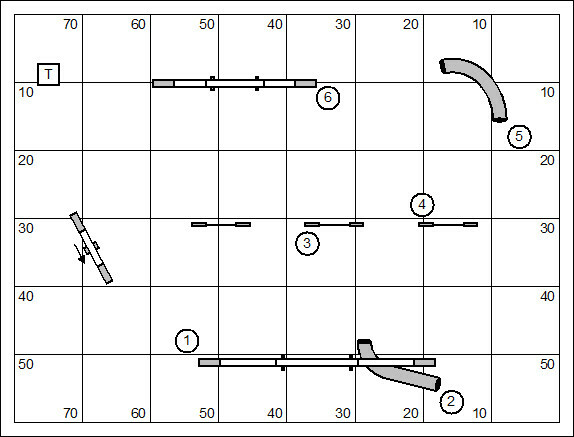 A real bold handler might push the dog on his right lead out of the weave poles, and race into a Blind Cross to create an approach that slices through jump #7 and neatly on to jump #8; and wouldn’t it be nice to have dog-on-left after jump #8? The #9 cone is in the center of the U-shaped pipe tunnel which traditionally means that the entry from either side is dog’s choice. 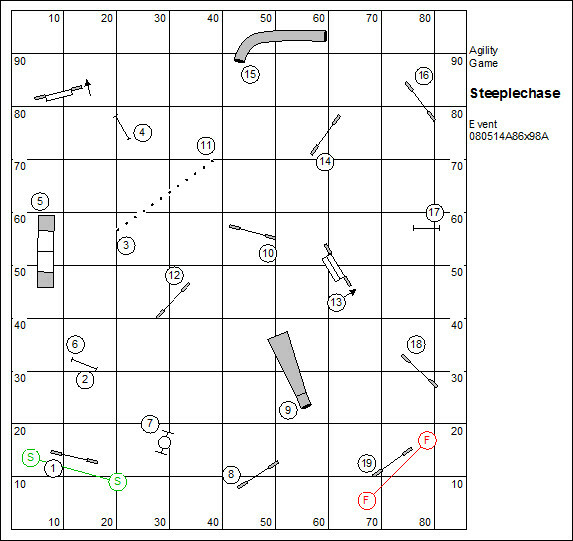 We would probably really like the dog to go into the left side, because this lines the dog up in a nice straight line through jumps #10 and #11. However, don’t push too hard after he turns back from the #8 jump. Just a bit of pressure might put the dog wrong course over the #10 jump. 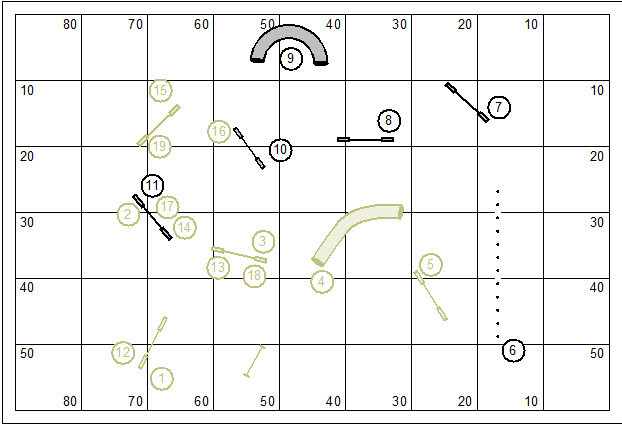 The second half of the course is a technical jumping sequence that challenges my course memorization skills. It’s a good idea to shape-to-shape the sequence to simplify the memory of it. I’ll try to demonstrate “shape-to-shape”. Pinwheel ~ #11-12-13 is a three-jump pinwheel. Serpentine ~ #13-14-15 a three-jump serpentine. Note that the #15 jump is a modest Backside. Bow Tie ~ #16-17-18-19 starts with wrap on the landing side of jump #16. There really isn’t any compelling wrong course option to the dog in the turn. The handler would like to get the dog to wrap tight and turn back neatly. 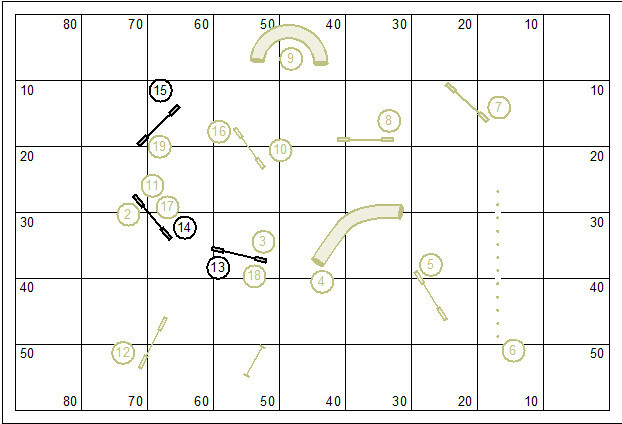 This might be solved with a simple Front Cross, but… mindful of the wrong-course option (#12) after jump #17 I’ll probably call my dog into a counter-clockwise Back Pass, shaping his a flat trajectory to #17 that helps leave off the wrong course jump. After jump #18 the handler will pull across the box to the finish. Be mindful that the #16 jump looms as a final wrong course option. So the simple memorization trick is to “chunk” the course shape-by-shape, making the second half of the course easy to memorize: Pinwheel to Serpentine to Bow Tie. 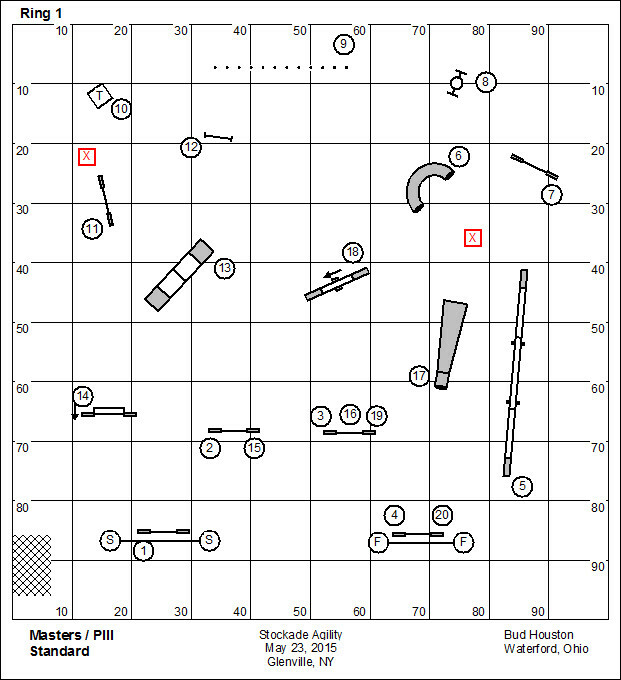 This is a tough course for a “pure for motion” dog. So the riddle becomes how to stay in motion and communicate to the dog the order and direction of obstacles. The Captain Obvious notation: if you are standing still it’s unlikely that you are moving well. Kory is a bit lame today, so I did not get to run the course. Obviously I did obsess over it a bit. I’m off in the morning to judge a USDAA trial up in Schenectady. My class will run league on Monday. I’ll run it when I get back. After league play last week I had an epiphany about my role. Back in the day, when we did league play at Dogwood I was philosophically disposed to take the “long view” on the performance of my students. My objective in league play was to see how my students used the skills that we were teaching to solve the puzzle of competition. And frankly, the weekly league (8 years … 48 league runs a year) directed me on the content of instruction because it helped to identify tangible weaknesses that needed to be addressed by that instruction. But now our club is competing with other clubs on the continent. Now my role must be that of a coach. By rights I must counsel my teammates on handling strategy and games strategy so that we can hoist our performance scores. That is not to say that I shouldn’t be shaping curriculum to specifically address the needs of each student who comes to train with me. This past week we had a three-day camp here with Sue Sternberg and her posse of dog agility fans. We got to run several courses from the National Dog Agility League catalog. I’ve left one of those on the field. We’ll start with this course in the Masters class this evening. This will give me an opportunity to explore my new role as Coach. To tell you the darned truth, I’ll probably hold my piece until I watch my team walk this course. I’ve always said that I can tell exactly how a run is going to go for a handler by watching them walk the course. This will give me the chance to intercept awkward approaches to solving this course puzzle. What would you say are the bits that could use the services of a coach? The initial approach to the weave poles is interesting. The dog A-frame looms as more of a wrong course option than you would think. The handler also should preposition himself for the dismount of the weave poles. The handler needs to drive for the presentation of jump #8. While there is no actual refusal fault for the dog passing up the jump, we don’t want the run to go wobbly here in the thick of things. The second approach to the weave poles is a virtual backside. The duty of the handler shall be based upon the dog’s skill in gaining the entry from an acute angled approach. Know thy dog. The final bit down the right side of the ring begins with a back-side approach to jump #16 and then a long straight stretch to finish the course. Wouldn’t it be cool to have a dog who can be sent down that line of jumps? Wouldn’t it be cool to have a dog that can be sent down a line of jumps? This allows the dog to work at full speed rather than waiting for his ambling handler. You are currently browsing the Bud Houston's Blog blog archives for May, 2015.